"Elliott opens up 22 point Supersport Championship lead in Sydney"
Brayden Elliott has continued his early season form in the Supersport class as part of the Swann Insurance Australasian Superbike Championship with the Tumut rider taking second in both the AFX-SBK and Swann Series, opening up his lead in the latter to 22 points with four rounds remaining and a trip to Queensland Raceway in just over a month’s time. Friday’s three practice sessions saw Brayden set the third fastest time on merged classifications with a 1:35.299, just 0.1 seconds away from the quickest lap. Qualifying displayed an overall improvement in lap times by 0.8 seconds, with Elliott achieving a 1:34.569, placing him third for Saturday’s first AFX-SBK series race. A third place finish backed up by two second’s in Saturday’s three races handed Brayden second for the round and third overall for the series on points, with his lap times from the races placing him in second on the grid for Sunday’s events. Entering the event, holding a slender lead in the points for the Swann Series in Supersport, Elliott identified the critical need to create some breathing space between him and his closest competition in the points. Two second place finishes in the day’s first two races, backed up by third in race three handed him second for the round, increasing his lead in the Championship to 22 points. "I’m very pleased with my efforts at round three of the Swann Insurance Australasian Superbike Championship. To walk away from the round with an extended overall Championship lead and podium finishes in all six races was a great result for us for the weekend." "The Hankook Tyres Suzuki GSX-R 600 was once again performing very well and I can’t thank the team enough for their efforts as we all worked together improving bike setup throughout the weekend. I felt like the handling of the bike was great and had amazing feeling from Dunlop tyres, I would like to work on trying to increase my speed down the straight before we return to Sydney Motorsport Park later in the year." "The racing was extremely tough with some of the closest battles I had experienced all year, thankfully my consistency in all races paid off to put me second overall which helped to increase our lead and puts us in a good position heading into the next round at Queensland Raceway in August." Brayden’s next event is round four of the 2015 Swann Insurance Australasian Superbike Championship which takes place at Queensland Raceway, Ipswich, Queensland from August 14-16. In-form Suzuki racer takes pole and two race wins in Western Australia. Brayden Elliott has extended his lead in the Australian Supersport Championship at the latest round of the Australian Superbike Championship at Perth’s Barbagallo Raceway, with pole position and a clean sweep of race wins helping Brayden to open up a 19 point gap to his nearest competitor. On combined times from Friday’s three practice sessions, Brayden secured the fastest lap with a 58.277, just 0.1 seconds ahead of second, reflecting the closeness in the field around the short Barbagallo track. A subsequent improvement in lap times during qualifying saw Brayden take provisional pole in the first session with a 58.235 which proved to be enough to secure the Tumut rider the number one placing for race one. The second qualifying session saw Elliott record a 58.353. After securing pole position, Brayden continued his trend of successful results, taking the win in race one by 3.6 seconds. With the win filling the 20 year old with a wealth of confidence, Elliott went on take the win in the second and final race by 1.6 seconds, subsequently handing him the round win and helping to extend his lead in the series. Brayden’s next event is round three of the 2015 Swann Insurance Australasian Superbike Championship which takes place at Sydney Motorsport Park, Eastern Creek, NSW from 26-28 June. Brayden Elliott has retained his Championship lead in the Supersport category following round two of the Swann Insurance Australasian Superbike Championship at South Australia’s Mallala Motorsport Park with a pair of podium results in both the AFX-SBK races on Saturday and Swann Series on Sunday, continuing Brayden’s impressive start to the year. A late session dash by Brayden in Friday afternoon’s qualifying session saw him claim the second quickest time with a 1:09.327 on lap nine of eleven in the session, handing him a front row start for the first race of the weekend. The starting position for Elliott helped him go on to claim second, third and fourth in Saturday’s three races for the AFX-SBK Championship, subsequently taking second overall for the round and first in B-Grade. The results now also place Brayden in third for the outright Championship and first in B-Grade. Another front row start for Sunday’s three races as part of the Swann Series for Brayden saw him claim the win in the first nine lap event, in addition to claiming the fastest lap of the race with a 1:08.959. Leading race two up until the penultimate corner, a mistake by the Tumut rider that forced his Hankook Tyres Suzuki GSX-R 600 into neutral which saw him leave the track, re-entering and crossing the finish line in seventh. A solid result in the third and final race of the weekend placed Brayden in second, with another fastest lap of the race. The result handed Elliott third outright for the round and first in B-Grade, thus retaining the lead in the series both in the overall standings and in B-Grade. Brayden’s next event is round three of the 2015 Australian Superbike Championship which takes place at Barbagallo Raceway, Western Australia from 22-24 May. Brayden Elliott has continued his impressive launch into the 2015 racing season. Brayden Elliott has continued his impressive launch into the 2015 racing season by taking a clean sweep of wins in the Supersport category at round two of the 2015 Australian Superbike Championship (ASBK) at Warwick’s Morgan Park Raceway in Queensland. Elliott also took a convincing pole position, setting up an impressive run of form on the back of his Australasian Supersport Championship round win at Sydney Motorsport Park just two weeks ago. As he continued his expanded season of racing at the second round of the ASBK at Morgan Park, Brayden managed the third fastest time from the combined three practice sessions on Friday. Working intently with his team ahead of Saturday’s two 30 minute qualifying sessions, Elliott managed to secure the fastest time for Supersport in the first session with a 1:17.351 on the third of just three laps. The time would remain the fastest after qualifying two with Brayden placing second in the final hit out ahead of Sunday’s races. After setting the fastest time in the morning’s warm up session on Sunday, Brayden rode out to a 1.7 second lead in the first nine laps of race one, also achieving his fastest lap of the weekend to date with a 1:16.953 before a red flag stoppage with it to be conducted in two parts. Four further laps were completed with Elliott expanding his lead to three seconds by the completion of the race, taking the race win. Starting again from pole position in the second and final race of the weekend, Brayden engaged in a close battle with Queenslander Troy Guenther for the lead of the race before going on to take the race and round win and the fastest lap of the race with a 1:17.133. The weekend’s results have helped to see the Tumut rider rise to the top of the Championship standings by two points. Brayden Elliott: “We began our weekend with some good pace in practice. I had definitely benefited from our pre-event testing at Morgan Park as it was a circuit I had not competed on prior to that test. Our qualifying session was a standout, setting the quickest time and being able to maintain it through to qualifying two which was a real confidence boost as it became my first ever outright pole position in road racing. “I was feeling very confident going into race one after our successes on Saturday and I opened up a comfortable lead before the red flag stoppage. Luckily we were able to maintain our gap and pull away further in the restart to take a convincing win. The battle with Troy (Guenther) in race two certainly provided a challenge but I was very happy to be able to take the win not only in the race but also for the round. Brayden’s next event is round two of the 2015 Swann Insurance Australasian Superbike Championship which takes place at Mallala Motorsport Park, South Australia from 15-17 May. The opening round of the 2015 MX Nationals held at Horsham, Victoria on Sunday the 29th of March proved to be a testing day for both of the Team Motul Suzuki riders. On a tough and technical circuit both riders showed tremendous pace with Matt Moss able to challenge for the race lead during moto two, while Kale Makeham consistently set lap times well inside the top ten throughout both motos. Unfortunately crashes in each of the two 30 minute MX1 motos for both riders left the team looking towards a more positive outcome heading into round two. For Moss the opening round of 2015 proved to be a painful day, as the two times reigning MX1 champion battled to salvage vital championship points after leaving the Horsham bruised and battered in 13th place overall with two 14th place moto finishes. “It was a tough day! I was feeling good going into the opening race but I had a big crash in turn two that really hurt my shoulder and done some damage to my neck.” Moss explained. “I got up and tried to charge but I was in a lot of pain but ended up salvaging some points. “I was not sure if I was going to be able to line up for race two. I managed to get to the line and was able to catch the lead guys and was challenging for first until another crash all but ended my day. Makeham in his rookie season in the MX1 class leaves Horsham with plenty of positives to build on. While the Victorian's 11-11 results for 11th overall were not quite what he was chasing, posting consistent lap times inside the top ten and the 8th fastest lap time in the opening moto, Makeham is confident that he will move deep inside the top ten as the series continues. "The final result today was not that great, I don't think is represents the overall performance," Makeham commented. "The first race I was happy with, I got a good start and rode to my potential and my fitness was good, my speed was good, I just put it down on lap two and had to charge from the back of the pack." "Race two I made some bad choices and it showed on track. A crash in the second race cost me a top ten result as I finished in 11th." "I actually learned a lot in that second moto, it was not like or crashed out or DNF'd and though it was not the result I was chasing there were some valuable lessons I will take heading into Appin and going forward. Team Manager Jay Foreman knows it is a long season and is confident the team will re-set and get their championship aspirations on track in two weeks time at Appin. "Matt crashed in the second corner and it left left him pretty banged up and all he could do was salvage as many points as he could." Foreman explained. "Kale showed good speed today, but he crashed in both motos and you are never going to have the perfect day doing that." "The chase starts from here, we will move on to Appin and there is only one way we can go and that is up." Foreman added. Team Motul Suzuki will next be in action when round two of the MX Nationals heads to Appin, NSW on the 12th of April. For further information on Team Motul Suzuki visit www.suzukimotorcycles.com.au. Like Suzuki Motorcycles Australia on Facebook; Also follow @suzukiaustralia and @suzuki_mx_aus on Instagram. Team Suzuki’s Wayne Maxwell wrapped up the 2013 Australian Superbike Championship at Phillip Island in Victoria on Sunday, 6 October, making it back-to-back ASBK titles for Suzuki and the GSX-R1000. Maxwell claimed Superpole on Saturday with a new national best lap time of 1m32.274 of the scenic 4.445-kilometre circuit, before clinching the title in Sunday’s opening 12-lap affair with a 0.014s victory. Later on in the afternoon Maxwell, competing with the brand new number one plate, claimed a fighting third position in mixed conditions to seal the runner-up overall for the round. “I didn’t start the season strong, but certainly gained momentum mid-season and it’s a credit to all of Team Suzuki,” Maxwell reflected. “It was awesome to do the fastest-ever Australian Superbike lap around here in qualifying and then to clinch the championship with victory in race one was a dream result. Team Volvo Group Suzuki’s Robbie Bugden was also in top form at Phillip Island, qualifying third and rounding out the top three in a thrilling first race. Second in race two cemented the five-time New Zealand Superbike Champion third overall for the round and championship. “It was a bit of a tough round, but we had a cracker race in that first race,” Bugden said. “That second race was a bit of a gamble, it was in terrible conditions. Overall in 2013 it’s been a great year. For Team Suzuki, we have been the only two riders who have been on the podium at every round, so it’s a credit to the team at Suzuki. Both Maxwell and Bugden featured on the podium at all seven rounds during the 2013 ASBK season, resulting in one of team manager Phil Tainton’s most successful years on record at Team Suzuki. “It’s one of our best seasons ever, if not the best,” Tainton said. “We had the guys on the podium at every round, they shared wins and worked really well together throughout the season as great teammates. Team Suzuki will now turn its attention to the 2013 Australian Motorcycle Grand Prix support races to be held at Phillip Island in Victoria on 18-20 October. Team Suzuki’s Wayne Maxwell and Robbie Bugden sit 1-2 in the 2013 Australian Superbike Championship with just one round remaining, following the penultimate weekend of competition at Hidden Valley Raceway in the Northern Territory on 13-15 September. Maxwell was fastest in regular qualifying and stormed to Superpole on Saturday afternoon with a blistering new circuit best lap of 1:06.997s aboard the GSX-R1000, while Bugden slotted his GSX-R1000 into second. Come Sunday Maxwell eased his way to a 1.697-second victory in the first 17-lap race of the weekend, while Bugden recovered from an early off-track excursion to finish a fighting fourth. The result marked Maxwell’s fifth consecutive race win. Race two was topped by Maxwell on track, however a 10-second jump start penalty demoted him to third behind eventual round winner Jamie Stauffer and Bugden, who led the race in its mid-stages. It was another pivotal weekend for Maxwell in his quest for a maiden Australian Superbike Championship, stretching out a 31-point advantage over Bugden with just two races remaining in the season. “The conditions were very difficult and I’d never won here at Hidden Valley, so that was the main focus,” Maxwell explained. “I didn’t want to take any big risks in terms of the championship though, so the plan was to play it smart and continue the season that we’ve had to date. Bugden was content with third overall on his Team Volvo Group Suzuki, boosting him to second in the series behind Maxwell following another consistent weekend. “It was an up and down weekend,” Bugden explained. “I made a mistake on Friday in practice, crashed out and missed that whole session, so we were on the backfoot after that. We had two pretty strong races though, even if I did run off in the first race. The seventh and final round of the 2013 Australian Superbike Championship will be contested at the picturesque Phillip Island Grand Prix Circuit in Victoria on 5-6 October. Team Motul Pirelli Suzuki’s Matt Moss clinched the 2013 MX Nationals, Australian Motocross Championship, at Coolum’s season finale on the Sunshine Coast in Queensland on Sunday, 1 September. Moss, 25, added the premier MX1 title to his 2009 and 2011 MX2 championships, in what was his return to Australia with Motul Pirelli Suzuki after spending a season in the United States last year. Today at Coolum Moss qualified second and won the opening 30-minute moto of the weekend in convincing fashion, before a calculated ninth in moto two sealed Motul Pirelli Suzuki and the RM-Z450’s first MX1 title since 2005 when Daryl Hurley achieved the feat. “I feel really good,” Moss beamed after finishing third overall for the weekend. “I’d just like to thank Motul Pirelli Suzuki, Jay Foreman and the Foreman family. It’s such a loving family and we get on so good. Teammate Cody Cooper was fourth overall at Coolum via a consistent 5-3 scorecard on the second of the Motul Pirelli Suzuki RM-Z450s, finishing in that same position overall for the 2013 season. Combined, Motul Pirelli Suzuki won five of the 10 rounds contested; Moss taking victory at Broadford, Appin, Swan Hill and Toowoomba, while Cooper claimed the Conondale overall. Team manager Jay Foreman said the championship came as a result of the team’s hard work, combined with Moss’ determination to succeed in the sport. After finishing a close runner-up in 2012, victory this year was ultra special for the entire team. “We had an awesome day, as the whole year has been,” Foreman explained. “We had to work our way into it with Matt entering the season under an injury cloud, plus he didn’t have a lot of racing last year. “He’s built momentum every week and improved so much. It just shows the maturity Matt has gained in his racing today and it’s a great result for the entire team. Team Motul Pirelli Suzuki will now turn its attention to the Australian Supercross Championship, which commences at Darwin’s Hidden Valley Raceway alongside the Australian Superbike Championship weekend on 14-15 September. The 30-year-old won all four 12-lap premier class Superbike races in fine fashion, now taking a 24-point lead in the championship following five of seven rounds. It was a convincing weekend for Maxwell and the GSX-R1000, working their way to the front of the field in each outing while Team Volvo Group Suzuki teammate Robbie Bugden made it a special 1-2 result during both rounds for the team. “What a weekend it was for Team Suzuki,” Maxwell said. “The Yoshimura-powered GSX-R1000 worked awesome in all four races, so to come away with four out of four shows how well the team and the bike are working. Bugden finished second in both races on Saturday after spending his fair share at the front of the field – round four’s second race providing some of the weekend’s best action as the Suzuki duo duked it out in the final stages. Sunday saw Bugden start from the Superpole position on the grid and he again led during both races. The five-time New Zealand champion was second in race one, before a hard-fought fifth in the second sealed him his second runner-up overall for the weekend. Bugden also claimed a new circuit record of 1m29.842s during Friday’s Superpole session, joined in the 29s by teammate Maxwell. Bugden also clinched a new race lap record of 1m30.445 in race one on Saturday afternoon. The Australian Superbike Championship will resume at Hidden Valley Raceway in Darwin, NT, on 12-15 September. Queensland favourite Robbie Bugden broke through for his first ever Australian Superbike Championship round win for Team Volvo Group Suzuki at Queensland Raceway on Sunday, 16 June. The experienced 32-year-old from Brisbane claimed a convincing race two win aboard the Phil Tainton Racing-prepared GSX-R1000, sealing him the overall victory for the round. Bugden earlier finished a fighting third in race one. Race one saw Team Suzuki’s Wayne Maxwell race to second and Bugden third, before the second 17-lap race of the day was an enthralling affair with Bugden edging out teammate Maxwell by just 0.338s in a 1-2 result for the defending ASBK champion team. Five-time New Zealand Superbike Champion Bugden claimed the overall victory from race one winner Glenn Allerton and Maxwell, now third in the standings after two point-scoring rounds and just one point behind Maxwell in second. Allerton has a 14-point advantage overall. Maxwell was satisfied with his overall result at Queensland Raceway after a practice crash on Friday proved a minor setback. Team Suzuki worked hard to get him back on track and he was able to reward the crew with their second podium of the round as he raced to a pair of second places. Team manager Phil Tainton congratulated both Bugden and Maxwell, proud to see the pair continue to challenge for the championship with both speed and consistency in its early stages. Bugden’s race two win to clinch the round was particularly satisfying for Tainton after a longstanding relationship of eight years. The Australian Superbike Championship will resume at Sydney Motorsport Park in New South Wales on 1-4 August in the series’ first appearance at Eastern Creek since 2009. Team Suzuki’s Wayne Maxwell finished a fine second overall during Symmons Plains’ opening point-scoring round of the 2013 Australian Superbike Championship, contested alongside the V8 Supercars in Tasmania on 5-7 April. Maxwell continued his transition to the Phil Tainton Racing-prepared GSX-R1000 at the technical 2.41-kilometre circuit, qualifying second in the new-look Superpole session before maintaining that same position in both Saturday and Sunday’s 16-lap Superbike affairs. Race one saw Maxwell in second on the opening lap before Team Volvo Group Suzuki’s Robbie Bugden squeezed past. The pair battled nose-to-tail throughout the entire race duration, however it was Maxwell who got the nod following a decisive move into the penultimate turn with two laps remaining. Maxwell again trailed Bugden in the early stages of race two before taking control of the runner-up position, asserting himself second in the series, 11 points behind Symmons Plains winner Glenn Allerton. The weekend’s racing action was televised live on Seven alongside the V8 Supercar coverage. After finishing second in the 2012 series behind former Team Suzuki rider Josh Waters and recently winning the WSBK Cup event at Phillip Island on debut with Suzuki, Maxwell is in a positive mood during the early stages of this season. “It’s my best ever start to an ASBK campaign, so I couldn’t be more happy with the Team Suzuki GSX-R1000,” Maxwell commented. “It’s a great way to kick-off the year, a satisfying result considering it’s my first official championship race on the bike, and we are gelling together in a really positive way. Fresh from winning a fifth New Zealand Superbike Championship, Bugden was impressive in Tasmania despite missing the pre-season test at the venue. He qualified third and backed up that result with P3 in both races contested. Team manager Phil Tainton was pleased to see Suzuki in the 2-3 positions on the podium at the season-opening round, providing the experienced defending champion team a firm base to work from in the early stages of the seven-round series. The Australian Superbike Championship will resume at Queensland Raceway in the first standalone ASBK round of the 2013 season on 14-16 June. Formed as a weaving loom manufacturer in 1909, Suzuki Motor Corporation of Japan started producing motorcycles in 1952. Suzuki is an established brand in the Australian market, as the third-highest selling motorcycle brand. For further information on Suzuki products, interested customers should visit their local Suzuki dealer, who can be found through the Dealer Locator on www.suzuki.com.au. Team Suzuki’s Wayne Maxwell claimed debut victory aboard the GSX-R1000 at Phillip Island’s ‘WSBK Cup’ in Victoria on 21-24 February, a non-championship event on the Australian Superbike Championship schedule in 2013. Hosted alongside the opening round of the Superbike World Championship at the iconic Phillip Island Grand Prix Circuit, it was the 30-year-old Cranbourne resident Maxwell who mastered the 4.445-kilometre circuit best in the national support category, in what was his maiden outing with Team Suzuki. Maxwell commenced his Suzuki career on top during Thursday’s opening practice session and continued that form into Friday by capturing the first pole position of the year in the single 30-minute qualifying session with a flying 1:33.695 lap time. Saturday saw Maxwell dominate the opening 12-lap race of the weekend, leading from flag-to-flag with a comfortable 4.796-second victory. It was a confidence inspiring performance, setting the quickest lap of the race at 1:33.535. Maxwell again dominated Sunday’s proceedings in the delayed second race, leading all 12 laps in superb fashion as he consistently lapped within the low 1:33 bracket. His best of the weekend came with a 1:33.073 on lap eight as he charged out front, eventually winning by 7.198 seconds. “Working with Team Manager Phil [Tainton] has been exceptional since I joined Suzuki, he’s great at making a connection with the riders, as is the whole team. It’s been fantastic in that sense, I can tell him what I am feeling on the bike and he understands me clearly to help us make real progress in these early stages of the year. “This weekend was a nice way to race the Suzuki GSX-R1000 for the first time without the pressure of championship points on the line, just starting off with another few days to get comfortable and work closely with the team in race conditions. Team Suzuki Manager Phil Tainton was pleased with Maxwell’s first official race aboard the GSX-R1000, using the weekend as a test bed as the team prepares to defend the national championship that they won with Josh Waters last year. “It was a really good weekend for Wayne and the team,” Tainton explained. “We’re certainly working around set-up to get him comfortable on the GSX-R and also to adapt to the new track surface at Phillip Island. In the last race we made some more changes and Wayne said we’re getting close to the money, so by the end of the weekend I believe we accomplished our goals. The Australian Superbike Championship will officially commence at Symmons Plains in Tasmania on 5-7 April. Team Suzuki’s Josh Waters will enter the final round of the 2012 Australian Superbike Championship with a 19.5-point advantage after scoring second position at Phillip Island’s penultimate weekend of action on 17-19 August. Fresh from a standout performance at the Suzuka 8 Hours in Japan, Waters put forward a consistent effort aboard the GSX-R1000, and is now in the box seat to secure his second career Australian Superbike title. After qualifying fourth in mixed conditions, Waters finished the opening 12-lap race in second, just 1.710 seconds in arrears of title rival Wayne Maxwell. He backed that result up in race two, which was reduced to 10 laps following an opening lap incident that caused a race stoppage. “The weekend was good for me, but obviously would have been better if we could have won the races,” Waters explained. “It was tough between myself and Wayne, but near the end my bike was moving around quite a bit so I decided to try and play it smart for the championship. Team Suzuki teammate Ben Attard was sixth overall at Phillip Island after qualifying an impressive second, taking home sixth place in both races. Attard was involved in the battle for the podium in race two, but ultimately had to settle for sixth due to a 10-second jump-start penalty. In his first season aboard the GSX-R1000, Attard now sits sixth in the standings. Team Suzuki Supersport campaigner Brodie Waters enjoyed a dream weekend at Phillip Island, picking up his first career double victory in the pair of 12-lap Supersport races. That result sees him climb to second in the championship, just half a point out of the series lead with one round remaining. 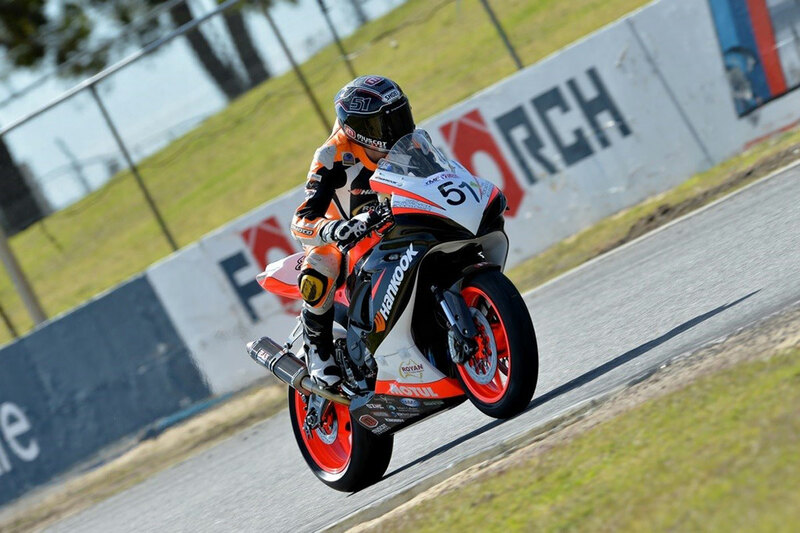 The Australian Superbike Championship will conclude at Queensland Raceway on 15-16 September. Well here we are mid season and just about to end our two month winter break with round six of the Australian Superbike Championship at Phillip Island this coming weekend. In my last end of season blog, we were preparing for the Phillip Island 8 Hour Endurance event, which I am very pleased to report that Team Suzuki finished 1st and 2nd place outright, which was a fantastic effort by the whole team as well as a great testament to the enviable reliability of our GSX-Rs. 2012 started off just as exciting as 2011 finished, with the arrival of our all new GSX-R1000L2 and a new Superbike rider in Ben Attard to replace Troy Herfoss who is chasing his dreams in Germany for 2012. The first round at the World Superbike event at Phillip Island was a great start to the year for us with Josh Waters winning the overall for the weekend on the new bike’s first outing and Ben Attard claiming his first podium with the Team on the new GSX-R1000L2 with a 3rd place in race one, whilst Robbie Bugden put some valuable points in the bag as well. Brodie had a bit of a slow start to the season but was soon able to change that around. After the first round and a little bit of testing, our new model GSX-R1000 has proven to be a big asset to the Team’s Championship assault with just a few subtle changes by the engineers at Suzuki in engine power and handling to its predecessor, the new bike has just what it takes to win. Warren, Hayden and I went through and rebuilt all the bikes before heading off to Darwin for round two where Josh just dominated again in the premier class. We then headed down to Perth to Barbagallo Raceway for round three with the V8 Supercars and then across the Nullarbor dessert to the Phillip Island V8 Supercar round. So you can see how busy the start of the year has been again, and with so many road kilometres to drive, I am very grateful we had our new Volvo Euro 5 Prime Mover to tow our Team trailer, the new Volvo is so quiet and smooth you really do think you are driving a car not a truck, and it was a bit of fun stopping along the way with all the V8 truck drivers. Round five found us at Queensland Raceway in Ipswich, providing a change of pace for our young Supersport Rider Brodie Waters who has been riding a Superbike at the two V8 rounds now finding himself back on his GSX-R600 contesting the Australian Supersport Championship again. I must say riding the Superbike certainly helped Brodie with the GSX-R600, as he rode so well at Queensland Raceway in very difficult weather conditions. So we ended up leaving Queensland with the overall win for Brodie and 3rd in the Championship by 12.5 points, Robbie and Ben in 5th and 6th respectively in the Superbike Championship while Josh built on his lead in the Championship to 30.5 points ahead of Wayne Maxwell in 2nd place. The next major event for Josh was the Suzuka 8hour where he rode exceptionally well and proved yet again how fast he is riding. Josh posted the fastest outright qualifying time and 3rd fastest in Superpole, but unfortunately the Yoshimura Team experienced some unprecedented bad luck and couldn’t realize on their fast lap times. I knew I had to get all the riders back on their bikes before our next round, especially Josh who has been doing so many laps around Suzuka on a World Superbike spec GSX-R1000 lately, and as the weather has been so wet down south here, we decided to take them all to Eastern Creek Raceway in Sydney NSW where we spent two very good test days on the new extended circuit and all four riders came away very happy with their bikes and the time on them. So that’s all from me for now as we finish our preparation for round six of the Championship this coming weekend, and I hope my next report is another favourable one for our Championship assault for both Superbike and Supersport.